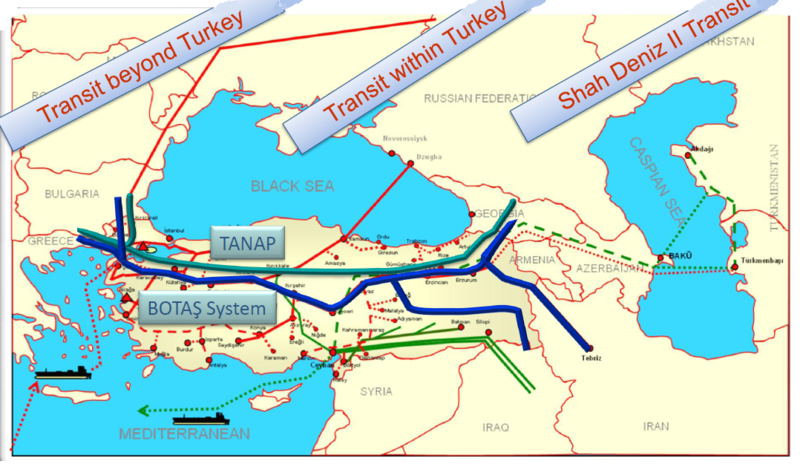 Turkey has signed deals to increase its stakes in the Trans-Anatolian gas pipeline (TANAP) and the Shah Deniz projects, with a ceremony. The Turkish Petroleum Corporation (TPAO) has acquired a 10 percent share from French energy giant Total and raised its total share in the consortium operating Shah Deniz gas field. Energy Minister Taner Yıldız said the TPAO would pay $1.45 billion to Total to raise its share from 9 to 19 percent. Turkish pipeline company BOTAŞ has inked a separate agreement with Azeri state-owned energy company SOCAR, increasing its share to 30 percent from 20 percent. The Shah Deniz field in the Caspian Sea, one of the world’s largest gas fields, feeds the South Caucasus Pipeline (also known as the Baku-Tiflis-Erzurum Pipeline) and the TANAP, which is planned carry Azeri gas both to Turkey and to other markets in Europe.